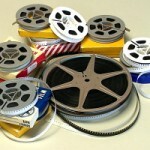 Transfer those old home movies into a format that can be easily stored and managed. Prices below are for the measurement from the center of the reel to the outer edge of the film. In addition to the base price, there is a $15.00 conversion charge for every two hours of movie that is captured. So, a 3 1/2 hour movie would have a conversion charge of $30.00 in addition to the base charge listed to the left. The first DVD copy is included in the overall price, if you would like additional copies of the same movie made for others, the additional DVD’s are $5.00 each. Can I make as many copies of the movie as I want? Yes, we can make as many additional DVD copies as you wish.